The Wind Experiment Kit (ALTurbine) can be used to test factors that affect the power output of wind turbines such as wind speed, generator type, blade design, and gear ratio. When a turbine is used to generate electric power, the wind (or water) move blades on the turbine. A multimeter can be used to measure voltage, which is the amount of power or how fast the DC generator is spinning. The multimeter can also be used to measure amperage, which is gauging how many electrons are being pushed through the wire. Requirements: The ALTurbine is designed to be used within a classroom setting. the classroom must have an electric supply to run a fan. The ALTurbine may also be used outside; however, it should always be facing into the wind. If the wind shifts and the turbine cannot rotate, stress and inefficiency increase. The following directions describe the assembly of the ALTurbine. For additional directions, images, and experiment ideas, please refer to the included manual. The ALTurbine is assembled in three parts – the tower, the nacelle, and the blade design. 1. Building the Tower: Lock the three blue plastic legs onto the center hub. Slide the locking disc on to the wooden shaft. With the locking disc teeth facing down, insert the wood tower into the central hub. Slide the disc into the hub, locking the tower in place. Set aside. b. (64 Tooth Gear Configuration) Screw a wing nut about 2/3 of the way up the 4” bolt. Slide the 2 motor mount sections up the bolt such that the two concave sections are facing each other. Then, screw a hex nut onto the bolt under the mounts. Slide the bolt (with nuts & mount) into the cutouts on the nacelle. Attach a wing-nut onto the bottom of the bolt so that it is secured to the nacelle. Note: Wing nuts and hex nuts are interchangeable – however, smaller gears may require the use of hex-nuts or removal of one mounting clip and replacement with a shim. c. Screw a wing-nut about 1/3 of the way up on the second 4” bolt. Slide the bolt into the top cutout and through the motor mounts. Screw a hex-nut onto the bolt under the mounts. Move the wing-nut up the bolt so you can slide the bolt all the way down to the bottom cut-out. Now secure the second bolt with another wing-nut. Secure all the bolts so the nacelle is tight. d. Loosen the motor mounts until the generator fits between them. Then tighten the nuts to hold it in place. The smallest (8-tooth) gear should be attached to the DC motor. e. Slide the driveshaft with the Hub Quick-Connect into the hole at the top of nacelle. 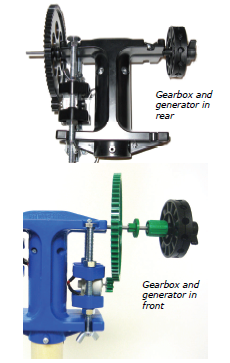 The driveshaft can be inserted either way, but is most convenient with the Hub Quick-Connect on the opposite side of the motor, so that gears can be changed easily, if necessary. Lock the 64-tooth gear onto the hex lock, and slide both onto the driveshaft. Align the 64 tooth gear with the 8 tooth gear. Attach the crimping gear to the Hub Quick-Connect. f. Slide nacelle onto tower. 3. Building and attaching Blades. Balsa wood has been included in your kit for your use however blades can be made out of different types of materials such as wood, cardboard, styrofoam, or plastic. Blades can also be different shapes, for example plastic cups or aluminum pie pans. Attach your blades to dowels with tape, hot glue, or regular glue. Insert dowels into holes on crimping hub. Having efficient blades is a key part of making power from a wind turbine. Some tips on improving blades include: shortening the blades, change the pitch, use less blades, use lighter material, smooth surfaces, get more wind, and blade shape. 4. Place ALTurbine in front of fan. When using a fan, the fan center should match up with the center of the wind turbine. Books or boxes may be used to prop up the fan if necessary. 5. Use the multimeter to measure amperage. Amperage will measure how many electrons are being pushed through the wire. A load or resistive object must be added in series with the meter. b. Put the black test lead into the COM port and the red test lead into the VΩMA port. d. Typical blades will make 0.1 - 0.3 amps (100-300 milliamps) and well designed blades will produce 0.4 amps. 6. Use the multimeter to measure voltage. Voltage will measure how fast the coils are spinning inside the generator. The faster the spin, the higher the voltage. a. The black wire should be plugged into the COM port and the red wire into the. b. Set the rotary selector to V=20. c. Attach the wires from the generator to the multimeter with the alligator clip wires (color doesn’t matter here). 1. Energy From the Wind: This packet will take 2-3 weeks to complete, individual activities can be chosen for shorter time frames. - Students will be able to diagram and explain how wind can do work. -Students will describe how electricity is produced. - Students will investigate the effect of blade variables on electrical output and design blades to achieve the best electrical output. - Students will be able to describe the terms: drag, lift, and torque. They also will be able to describe how aerodynamics of blades can affect turbine efficiency. -This will teach students to measure wind speed. - This gives the students a hands on activity allowing them to build, test, and evaluate their designs to achieve the highest possible electrical output and work production.